The world was a much different place 17 years ago. Facebook was still a gleam in Mark Zuckerberg's eye, we didn't all hate people who voted the other way, and Hyundai had just launched a brand new SUV called the Santa Fe—a cut-rate blob whose spartan interior and hopeless engine did nothing to counter the notion that Korean cars were, well, a little cheap. Evidence abounds to support Hyundai's maturation. The company's new N Performance division has given the italic H its first genuine hot hatch in the Veloster. The Hyundai Kona is both a weirdly appealing little ute and the base for a new electric vehicle that promises more range than the base Tesla Model 3. Now, with the launch of the next-generation Santa Fe, Hyundai is sharpening its all-important lineup of SUVs. The old Santa Fe came in two flavors: the two-row Santa Fe Sport and the longer-wheelbase Santa Fe that (sort of) seated seven. 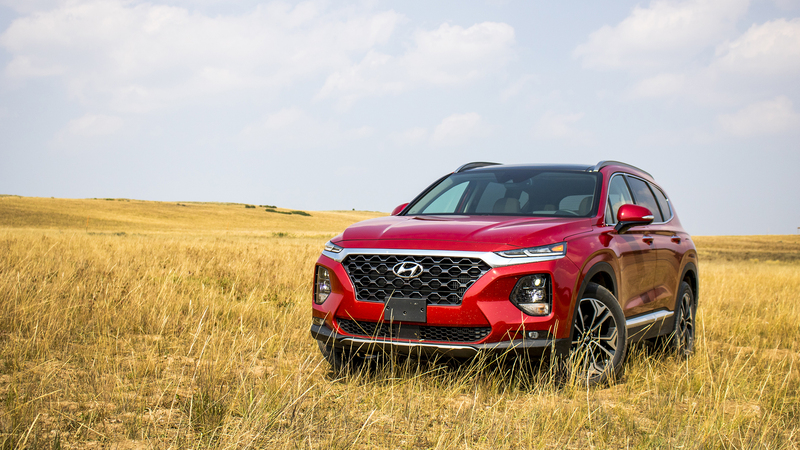 This new model replaces the former but takes the name of the latter, which is being rebranded the Santa Fe XL, and will soldier on for one more year before being replaced by an altogether different three-row SUV. So it's fundamentally back to basics for the Hyundai Santa Fe: a medium-small, five-passenger crossover, the same form that makes a mint for automakers everywhere. As my time with it in the mountains of northern Utah showed, though, the Santa Fe stands out in a few key ways. It says something that the Hyundai team opened their presentation to journalists by admitting the old Santa Fe looked too much like a melted minivan. The 2019 model's styling falls decidedly on the SUV end of the spectrum, with a few key design touches lending gravitas to the proceedings. 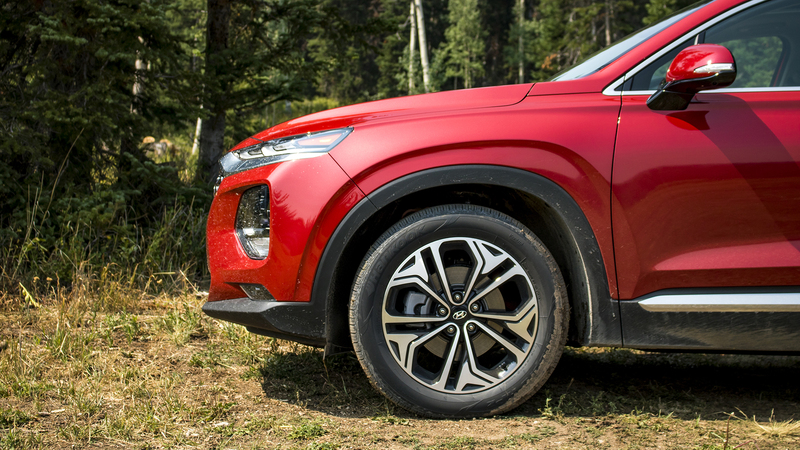 The more-upright front end sports a pair of stacked headlights that bookend the company's recognizable hexagonal grille; first seen on the Kona, it's a bold design that works far, far better here than it ever did on the competing Jeep Cherokee. Lines grow flatter and sharper as your gaze moves toward the back. The hood, beltline, and roof are all level in profile, the lines ending at a rear whose verticality mimics the front end. The wheels have been pushed towards the corners to minimize unsightly overhangs and give the appearance of capability. Overall, it's a strong, visually interesting, and cohesive look that stands out in this competitive class. And additionally, all that new sheet metal sits on top of a unibody structure that's been stiffened and strengthened six ways to Sunday. At 187.8 inches in length, it takes up less room in your driveway than a Subaru Outback, but more than a Jeep Cherokee. And if you think the Santa Fe isn't comparable to either of those when the going gets rough, read on. The interior does a good job mixing different materials to create a cabin that's airy, comfortable, and well-organized. Door-mounted side mirrors allowed for thinner A-pillars and the addition of front quarter glass; as a result, forward visibility is fantastic. There's your requisite 8.0-inch touchscreen display (7.0 inches on lower trims) that thankfully still comes swaddled in redundant buttons and knobs; an optional panoramic sunroof; tons of legroom in the back; and goodies like ventilated seats and rain-sensing wipers on higher trims. Four USB ports should limit inter-sibling squabbles. It all feels very smart, if not quite special. 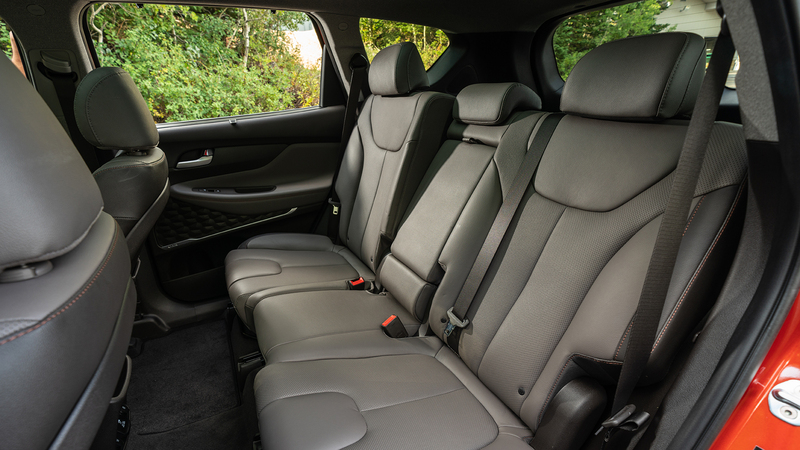 Regardless, the biggest bonus for most prospective buyers will be the extensive suite of standard driver safety features found in the Hyundai Santa Fe. Automatic forward and reverse emergency braking, full-speed adaptive cruise control, blind spot monitoring and assist, lane keep assist, automatic high beams, driver attention monitor, and a particularly clever system called Safe Exist Assist that aims to stop passengers from opening their doors into traffic are all standard on every trim. That's a far more comprehensive package than you'll find anywhere else at this price point. There's another impressive option, too: a rear occupant alert system that can detect movement after the car has been shut off (say, a child left in a hot car), trigger the vehicle's alarm, and send an alert to the owner's smartphone. 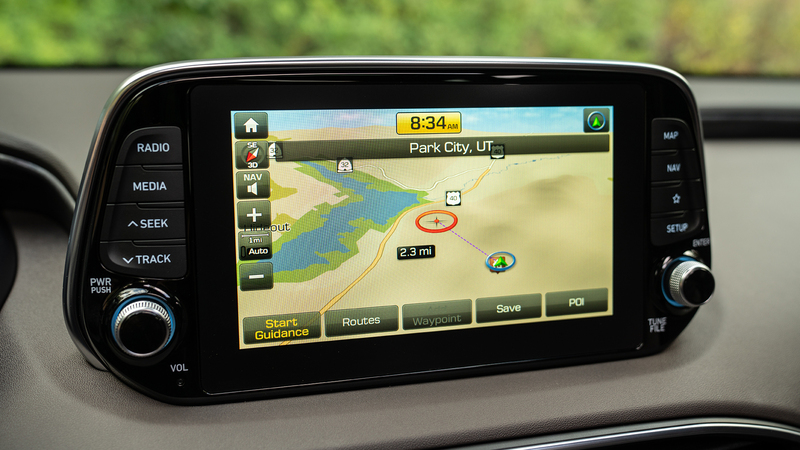 Still others will find joy in the standard Apple CarPlay and Android Auto compatibility. 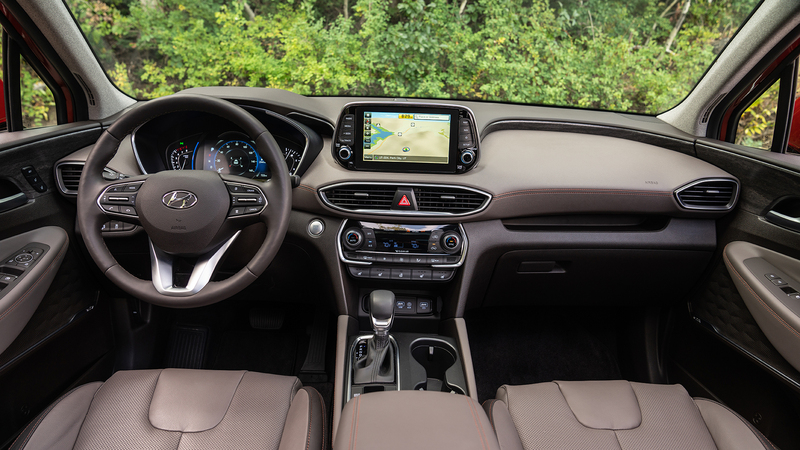 Options like a proximity key, a hands-free (and foot-waggle-free) automatic rear hatch, and a heads-up display are unlocked as you move up from the base S model to the Ultimate trim sampled for this first drive, but every Santa Fe benefits from a lot of behind-the-scenes work, like extra insulation and laminated side glass to make the cabin as calm and quiet as possible. 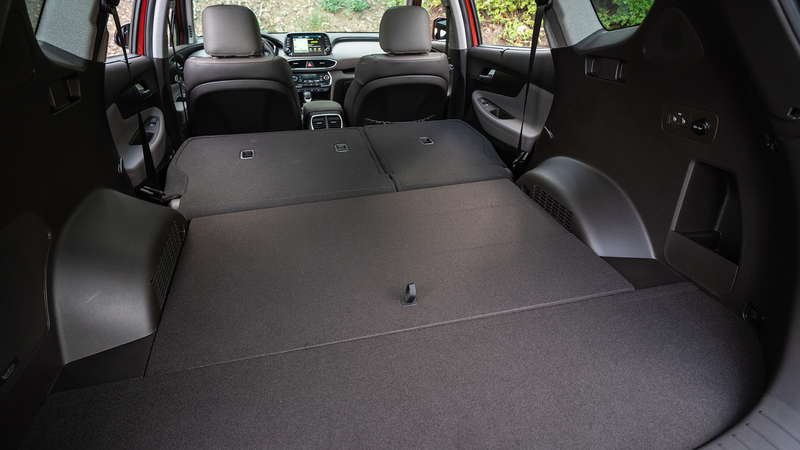 Cargo space is preserved by the upright exterior design and ditching the third row, but it's still middle of the pack at 36 cubic feet behind the rear seats and 71.3 with the rears folded down. 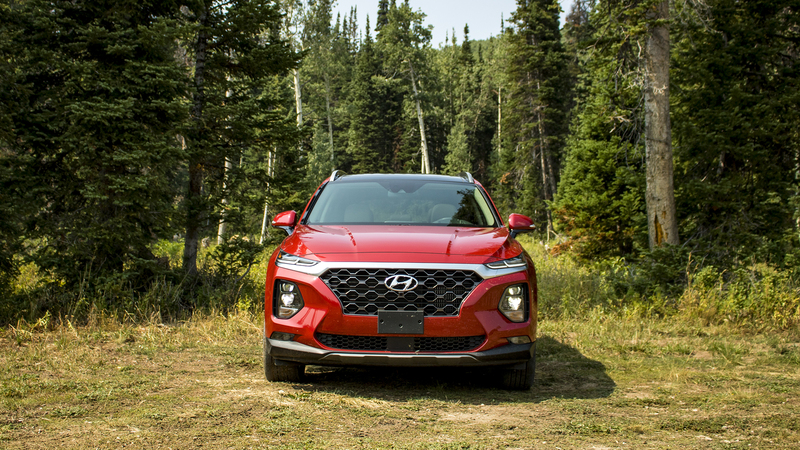 It speaks to the strength of the rest of the vehicle, the dropping of the word "Sport" from its name, and the fact that no one is buying a Santa Fe for the fun of it that the two engines on tap for the new model are perhaps the most unremarkable part of the experience. Every trim comes standard with a 2.4-liter inline-four that generates an unremarkable 185 horsepower and 178 pound-feet of torque, while a 2.0-liter turbocharged four-cylinder (235 horsepower, 260 torques) is available on the two priciest models. Both are married to an eight-speed automatic transmission that doesn't get in the way, but come with an idle stop/start setup that occasionally does. Hyundai's Htrac AWD system is a $1,700 option on any trim. It runs primarily in front-wheel drive mode until traction loss is detected, at which point up to half the engine's power will be immediately sent to the rear wheels via a new AWD coupling device. Brake-based torque vectoring further divvies up the power between each wheel on a given axle, all of which can be seen in real time on a handy monitor in the gauge cluster screen. Hyundai claims Htrac uses data from 50 separate input signals—everything from throttle position to yaw rate to the outside temperature—processed 100 times per second to deliver power in optimal fashion. Comfort, Sport, and Smart driving modes further refine the distribution, and also affect shift times and steering feel. Where the Santa Fe falters most is fuel economy. The base engine and front-wheel drive delivers an okay 22 miles per gallon in the city, 29 on the highway, and 25 combined. Swap in the 2.0-liter turbo and all-wheel drive and those figures drop to just 19 mpg city/24 highway/21 combined. That's...not great, Bob. With a curb weight of around 4,000 pounds, this might be a case where a V-6 would do it better. 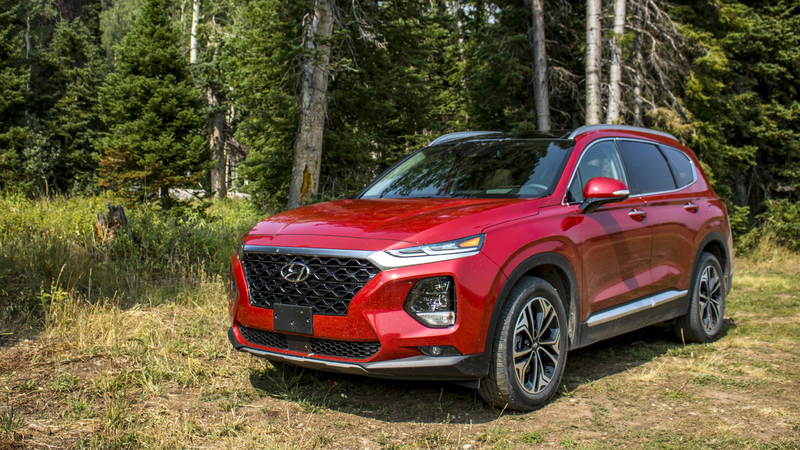 Hyundai chose the high-elevation clime surrounding Park City, Utah to show off the Santa Fe as a signal that it doesn't think a bunch of buffet-beat journalists complaining about the lack of power at altitude will dim its star in the eyes of real buyers. For what it's worth, they're right—but it still bears mentioning that the turbo promises peak torque at 1,400 rpm, and failed to deliver anything approaching a healthy off-the-line launch at 6,000 feet. The start/stop system also adds about a second's hesitation when you floor it from an engine-off stop. You're not getting anywhere posthaste in the Santa Fe...and keep in mind, this was in the more powerful model. Still, the ride is noticeably smooth and quiet, bordering on refined. Of all the fancy tech on board, nothing makes as big a difference as the impressive lane keep assist, which indeed kept the Santa Fe centered in its lane with zero ping-ponging on a curvy stretch of mountain highway. It's not a hands-free system like Cadillac's SuperCruise by any means, but it reads the lanes well, and applies a surprisingly accurate amount of torque to the steering wheel. Not shockingly for a family crossover, road feel is purposefully distant. Where the Santa Fe surprises most is off the pavement. It's been a long time since we expected unibody crossovers to be able to do anything of significance off road—so long, in fact, that the market has cycled back around. 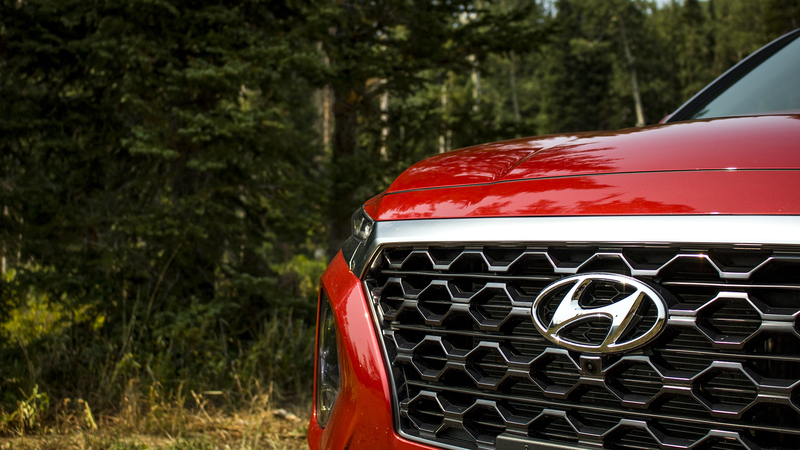 In a world where Jeeps and Subarus are enjoying record sales, Hyundai saw fit to add a little more than the mere appearance of all-terrain capability. The Htrac system still offers a dashboard button that locks the torque split at 50/50 front-to-back and continues to adjust power across each axle. The Santa Fe also offers a hill descent control feature to clamber down steep slopes without using the brake pedal that works as advertised. 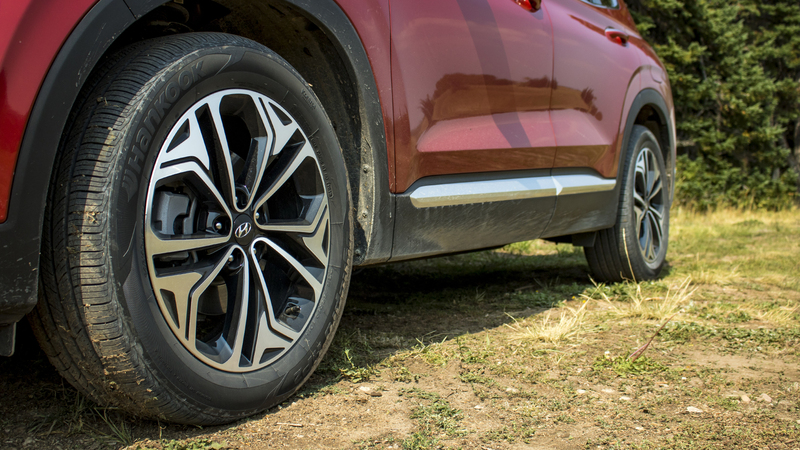 Ground clearance and wheel articulation are in short supply, but there's no doubt the Santa Fe can handle far more than any realistic owner would throw at it. 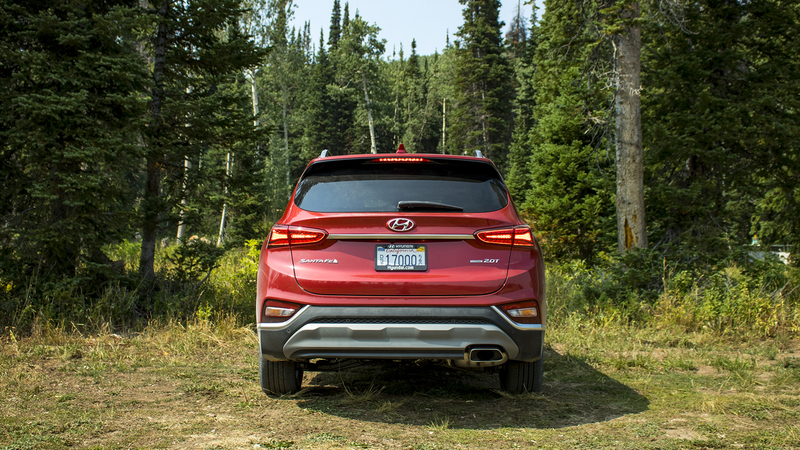 Between flying down a washboard gravel road in relative comfort at 50 mph (the revised suspension certainly helped there too), plunging through a two-foot mud bog, and climbing up and down a rutted dirt trail that had been washed out by a severe thunderstorm just 12 hours prior, the Santa Fe showed its SUV guise is more than just an act. 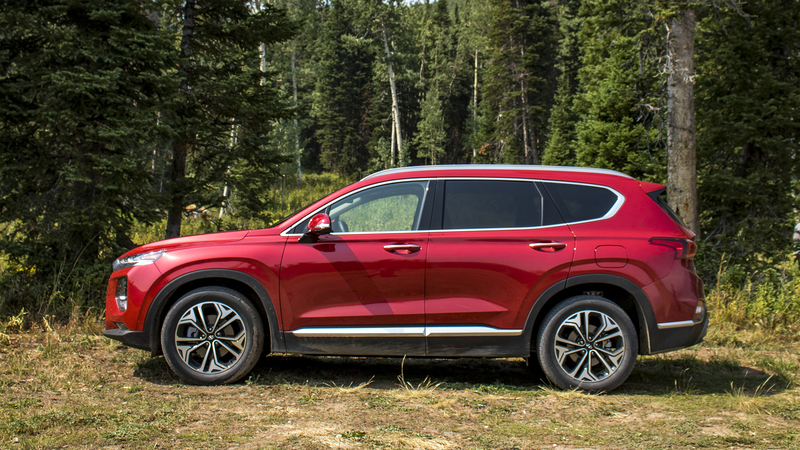 The 2019 Hyundai Santa Fe is proof the Koreans are on their game at the moment, and in fact have a real shot at dethroning their neighbors to the east when it comes to being the first word in sensible transportation if they keep it up. It's visually striking, packed with advanced tech, and legitimately capable off-road. Toss in the company's famous 10-year/100,000-mile powertrain warranty and a starting price of $25,500, and the Santa Fe instantly becomes a strong contender in a crowded segment. Don't call it a comeback—Hyundai's been here for years. It's just finally got an SUV to match. The Korean carmaker gives Elantra a thorough refresh.